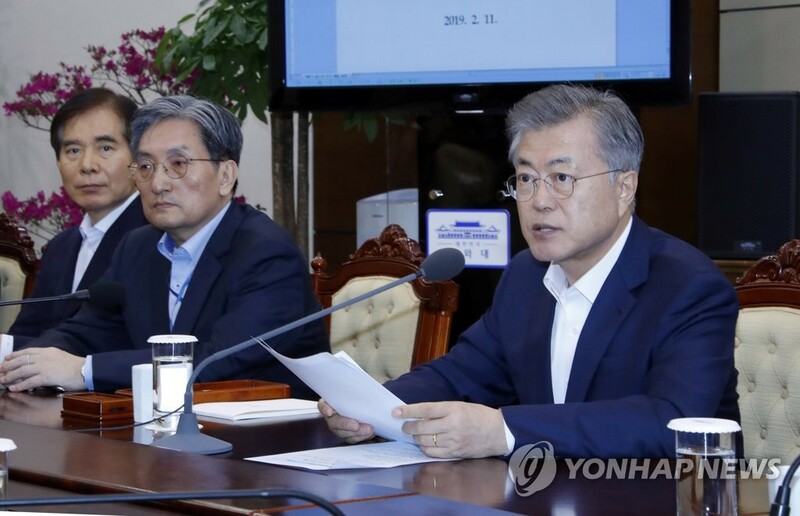 SEOUL, Feb. 11 (Yonhap) -- President Moon Jae-in said Monday the upcoming second summit between the United States and North Korea will become a critical turning point for the complete denuclearization of the Korean Peninsula and peacemaking process. "(The upcoming summit) will become a critical turning point that will advance to a specific and tangible level already agreed-upon principles, including the complete denuclearization of the Korean Peninsula, new U.S.-North Korea ties and a peace regime on the peninsula," Moon said. U.S. President Donald Trump and North Korean leader Kim Jong-un plan to hold their second summit late this month in Hanoi following their historic first meeting in Singapore last June. Denuclearization talks between Washington and Pyongyang have since been in a deadlock, with the North calling for "corresponding measures" by the U.S. in return for denuclearization steps that it has taken so far. The U.S. wants concrete steps for the North's denuclearization. "The fact that we are at the center of a change that was not even imaginable just one year earlier did not come by chance. It was possible because peace is the right path and our determination finally reached that path," he told the weekly meeting held at his office Cheong Wa Dae. The president insisted the second Trump-Kim summit will move the denuclearization process forward. "The first North Korea-U.S. summit was a historic event itself that was a clear milestone in world history. The upcoming second summit will take us a step further from here," the president told the meeting, according to Cheong Wa Dae pool reports. "Those who appear to wish for the era of confrontation and conflict to continue also do not seem to be too few," he said. "But the reason the leaders of South and North Korea and the United States are walking that path without flinching is because they have strong faith in the direction that our history must move toward," the president added. "What's more important for us is that the meeting will be a critical chance that will help develop inter-Korean relations," he said. "Our future depends on stable peace."